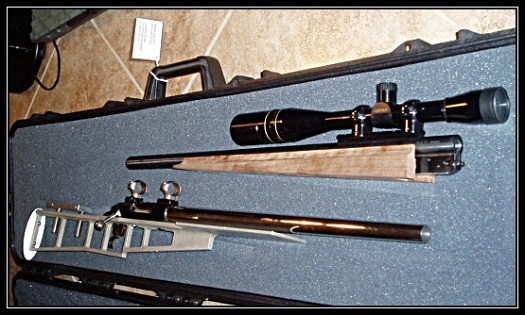 On the top is my benchrest 6.5mm SS Bower Encore barrel with a Leupold 36X scope. I modify a 444 marlin case to make this round. 444 Marlin is basically a lengthened 44 Magnum round. 44 cal= .429 and I neck the case down to 6.5mm/.264,, Amazing long distance accuracy at 500 yards plus. The one on the bottom is my benchrest 6mm PPC- Palmisano & Pindel Cartridge. Extreme accuracy out to about 300 yards.